I’ve enjoyed this little piece of the arc with the board game I made up. Thanks to everyone who gave their thoughts and feedback on it. It’s a fun idea. Some of you suggested I work on making it a real game. I don’t know if that’s feasibly a thing I could pull off, but I have discovered 3D Print shops are more common in my area than I realized, so… hey who knows. If Treasure of Dragon Mountain were a real game, I think the annoyance factor of getting shaken off the mountain every so often would need a lot of balance tweaking to prevent, well, exactly the scenario Theo just pulled here (effectively hard-resetting the whole session). Defensive cards like the Lasso are good, but player mobility and speed of ascension up the mountain would need to be factored around the periodic shaking. Not going anywhere with this, just a thought. I would totally kick in on a Kickstarter campaign for that game! Plus share the hell out of the page to other dragon-obsessed friends. Seconded. While I’m trying to save funds, this is the sort of thing I’d kickstart in a second. Got a bit into that there, just goes to show you’ve got a solid idea for a game there. That was a brilliant suggestion. Which would make it a whole lot easier to produce, too. I like where this is going! Before a Kickstarter for a physical game, there should be a prototype, like maybe something in Tabletop Simulator, for proper playtesting. If we arrange some sort of live playtesting online, I would love to be in on that. It’s 2-6 players, right? If there’s any reason to make it for more players, I suggest having pairs of each character type, where you usually have teams that share the same strengths and weaknesses. Though there should be a way to play with a good group that has an odd number of players — maybe one person gets two characters, or gets a special ability or more cards or something. I write this comment below but it makes more sense as part of this discussion. If you produce a rules list, i will code it. Or if you would like, I can make the rules based on what we have seen so far and fill in the gaps in the rules. I would. This is exactly the type of game my family would play at get-togethers. Amanda’s the **** you talkin’ about old man, face is the best thing ever. It is. I can’t even mimic it without getting a face cramp :/. Selkie’s expression in the last panel, though, doesn’t seem to work so well. Partly just because of the exaggerated size of the eye obscuring everything else, and the way the mouth is drawn. I’d redraw it. I wonder if anyone but Grandpa Theo realizes the truth of Andi’s words. They are, in fact, ALL basically starting over. And yes, Todd, it’s definitely a blunt force life lesson. Let’s not forget, Todd has been the recipient of more than one “blunt force life lessons” from Theo and Mari … shoveling manure among them. Oooh ooh ooh ooh ooh! I don’t know if that was intentional but I love subtext and symmetry like that! By the way is Todd glaring at Theo or Andi? It ‘looks’ like Andi, but it makes more sense to be Theo. If he’s glaring at Andi, I’m gonna be pretty upset with him. I assume it’s a playful mock glare at Theo though. And Mari also looks like she’s glaring at Andi for that matter, but I also assume it’s a playful glare at Theo for his stunt. Looks to me like they are both glaring at the kids. Andi’s not making much eye contact lately, and her body says leeemealone. I was thinking Todd’s expression was more of a thoughtful and annoyed “Well, I knew this wasn’t going to be easy” look. What I mean is, their gaze seems to be going towards Andi, which makes very little sense to me because she hasn’t done anything at the moment. Their expressions seem dissatisfied with what just occurred so I assume their gaze is supposed to be directed at Theo, but it very much looks like it’s directed at Andi. If that’s the case hopefully Theo can knock some sense into their dense you-know-whats. I assumed the expression was about Theo’s stunt, but she was looking at Andi at the moment because she was talking, so basically not glaring, just kind of a sympathy wince “yeah, I agree with you”. Same with Todd – expression directed at Theo, gaze shifted elsewhere. Todd and Mari are both glaring sternly at the girls, who are both hollering in protest against having to learn a life lesson. Dave, if you want to talk to a professional gamer, and Lots of amateurs, go to WindyCon 42, this weekend at the Wyndam outside Chicago. Andy Looney will be there, and he knows more about game theory from a practical tactical side than anyone I’ve ever met. Not to say he’s a math wiz, he’s a gamer’s Pro. Just a thought. I was not expecting that twist, and it works beautifully. There actually is a vaguely similar game called Dragon Strike. It was published by Hasbro in 2002. No mountain sadly, it was a board with a mechanical dragon in the center. It had a long neck that it would occasionally swing around to randomly knock players over. I think the focus was also more on treasure collecting? Remember the exchange between Selkie and Theo in #679, when Theo said “I’m very sneaky”? He just proved it again. I agree; I’d donate to a Kickstarter campaign. You could also consider drafting and selling game rules and let people come up with their own pieces. For instance, the volcano is awesome – but it could be represented by a flat spiral on a board if someone wanted a portable or inexpensive version. Rule sets / card packs could also be lower level Kickstarter rewards, as many games of this nature tend to end up in the $50 range. $10 donation gets a pdf of the rules and card descriptions. $20 gets that plus a printable pdf of the cards with their artwork. $30 also gets a deck of cards and a set of 3d printing instructions (so people who have their own 3d printers, or access to them, can print the game pieces rather than wait for them to be mailed). $50 gets the finished, fully assembled, game. Add custom artwork (donor’s face on a card, or donor as a playing piece), signed items, etc. at the $100-$1000 level. Prison Architect added the ability to get your name in the game, complete with visuals and bio — I thought it was one of their most clever funding gimmicks, because it let them put their design efforts elsewhere, while fans designed the numerous prisoner bios, and it led to some pretty funny stuff. By that token, if this goes to the Kickstarter phase, have 6 or 12 positions at the Design a Character level — not sure how much these should be, but pricey — and set some guidelines (e.g. family-friendly) and let the fans come up with ideas and maybe general sketches for you to create characters from. The people who buy in at that level create the name and general visual description at minimum, and ideally also get to choose which strength/weakness combo they want (first come first served). Totally reminds me of a game called “Don’t Wake the Dragon” except in that you’re penguins trying to steal back your stolen eggs. Super fun as a kid. Theo, you fool. You FOOL. Today’s comic makes Theo’s “bide my time” comment in #703 especially pertinent. He observed the interaction in the marker fight (how they were escalating into an outright war before the adults stepped in and stopped it) and figured the same would happen in the game (which it did). My guess is he was holding on to the Horn of the Wyrm card waiting for just this to happen. Theo doesn’t miss much. Look up a game called “Key to the Kingdom” (https://boardgamegeek.com/boardgame/1933/key-kingdom) It is almost exactly like the game you created for the comic. There are traps, cards you need to escape them, and lots of random rolling. My friend Dan uses it as a threat because of its propensity to set everyone back to square one. Well, a full restart would be the only fair thing to do now, since the girls took those three turns in a row. Even if they’d dropped the traps behind them for fortification, the horn would still have knocked them down. The only card that would have been useful to save is Amanda’s second lasso. “You have to start over” is a pretty frustrating game mechanic, in general. It might be OK if the characters have personal stats (“leveling up”) that they keep when that happens, and one of those stats is something equivalent to “speed”. I presume Theo would have just sat on it had they worked together, letting them learn on their own to work together towards victory. I can’t agree with a start from the beginning mechanic. If I was designing the game, I would have turned it into a roll a die, lose that many actions. In fact, I would give each character a different number of actions to replace speed rather than using a Roll and Move mechanic. Like a character good against monsters might have three actions with a positive modifier against beasts to signify heavy armor and weaponry. And a character better against traps, I would give five actions and a positive modifier against traps to signify a speedier character with lighter armor and tools. We’re all brainstorming here — Dave will choose the ideas that best suit his conception of the game. I would definitely say that starting from scratch is generally a bad mechanic. Perhaps the higher you go the slower you go, allowing people to catch up? Have three different colors or shades of terrain, and maybe have a spot between them where you have to stop when you reach it, so there’s no questions about what happens when you spend move points in two different terrains. Then, say, have the early parts let you move up to 5, the middle parts up to 4, and the top parts up to 3. That’s the limit of your regular move in a single turn, but you can always throw cards to let you move a bit farther, or throw cards against other players to make them move slower. Make the cards terrain-based. When you’re near the start, there’s more cards to boost you along and fewer cards to delay you. Near the end, people keep throwing delays your way and you’re lucky if you get any boosts (and if you have a boost and someone throws you a “lose all your cards” attack then you can just rage). Actually, possibly losing cards could be a good mechanic to balance with getting tossed down the mountain. Maybe (if you’re not hiding in a safe place) you either get tossed down 1-2 levels, or you can sacrifice a certain number of cards (maybe your entire hand, maybe not) to avoid getting knocked down quite that far. Maybe it goes like this: The dragon shaking knocks people down 1-3 levels, but if you abandon your gear it’s only 1-2 levels, and if you have a special card to play it’s at most 1 level, maybe 0. This is getting too complex. Needs to get simplified. But they’re ideas, anyway. Glue trap maybe keeps you stuck in place? Okay… Game over. It’s only seven-thirty. What’s next? Will they be turning their attention to any of those great big elephants standing so patiently in the corner of the room, waiting to be talked about? I think it’s probably best that that conversation not happen tonight. Tonight is about becoming more at ease with each other. Depending on how things go, this phase may take a few weeks, or it may take several months. It’s not really a good idea to discuss the emotional baggage until good level of trust has been established, so that they can actually discuss things rationally. Otherwise, it will just devolve again into the same issues and arguments that we’ve already been seeing. Am I the only one that thinks the game as it stands would be prohibitively expensive? I love the idea of the mountain tower and the dragon at the top, but that level of animatronics would be way too expensive. That’s a dragon model that roars, waves its wings about and the eyes probably light up. While awesome, any company would use that to make the game cost about $120 bucks. That’s too much for just any family game room. The tower would also up the price. So as things stand, I don’t see it being a great success, sorry guys. However, this is not a game without legs. How about a board that spirals but you must set the tiles yourself for a new game every game? Anyone who’s played Forbidden Island immediately knows what I’m talking about. Tiles that you shuffle and place on blanks on the board to signify the trail up the mountain. And if you want a dragon, a little flat dragon face made of plastic that has a small speaker and light up eyes. My copy of Exploding Kittens has a chip in the box that reacts to light. You open the box and it meows at you. This could easily be used when you press a button, most likely an ear, and the chip activates, making it roar and get the eyes to light up. These changes could drop the price. Probably to around 70 bucks. Still on the middle to high level costs in a hobby store, but certainly easier to swallow than 120. Well, we’re considering a flat board version, but really, it’s not to the level of what I would call animatronics. It’s a small motor (shaking) that additionally turns on a pair of LED eyes and pulls on wings with the same kind of mechanics you get in a $2 Happy Meal toy. And a sound chip is not that expensive, or it wouldn’t be used in $5 greeting cards. It’s possible to have this be triggered by humans rather than an egg timer, but the timing element is more interesting. And being able to have something delay the dragon (add some time to the timer) would be useful, if that mechanic could be added without too much additional work. I would say that this game probably dips above the $30 level (the level that currently my family shies away from, but is common for board games these days), but needn’t be above the $60 level. Though really, I’m making guesses from the Fred Meyer toy aisle shelves, which imply mass-produced games and the associated drops in cost due to good design and better manufacturing processes. I’m also thinking hobby shops since they are the ones that typically deal with Niche Games, and Niche Games have a higher price tag anyway. Even with a successful Kickstarter, that might be where the game goes anyway because Mass Produced is so hard to break into. Besides, this is all rhetorical anyway as Dave has made no statements confirming one way or another that he’s going to make this. Still, I have the Dungeons and Dragons board games that recently came out. I would love to see it in a print and play edition and use the little dragon figurine as my dragon stand in. It would need to advance by turns rather than timer. Something along the lines of a trigger mechanism (similar to the button on Don’t Wake Daddy, except I imagine the squares are the buttons). The caves are safe because they lock the character in place, while the other squares depress when the mountain shakes. Even if it costs like 70 bucks, this has the makings of something you would find in an RPG gaming shop. They tend to allow for higher end games. my one idea for this game if it were to become real, is have the mountain be collapsible. You know how you can have those light-up light-saber-like swords/wands/etc? Well you could have each ‘tier’ collapse into the one under it so that it eventually becomes a flat disc (there could be like, clasps or hooks that lock into place when you have it fully propped up)… and the dragon could be a removable piece you add to the top that you can turn on with a button (maybe an internal timer that’s triggered by having your game piece press down on certain buttons on specific squares as they move up the mountain? If it were hollow in the center & collapsible with pieces you add (like the dragon) to make it complete, it honestly wouldn’t cost much to make at all. Start with the board as a disk, but the path up the mountain is cut out in a spiral. There are anchor pieces at the top, eyelets through the layers, and a more solid base piece at the bottom (it’d be separate when in the box). Add a handful of support rods (3-5 solid resin or metal rods) which go from the anchor points, through the eyelets, and into the base creating a skeletal mountain board. A slow curve up the whole thing, save for the bottom of the base & the top where the dragon sits. Woo midnight hypothetical game thoughts! What Theo said doesn’t make much sense. Both were so close to winning so why wouldn’t they use their whole arsenal to take their only other competition out since the others are all the way at the bottom. 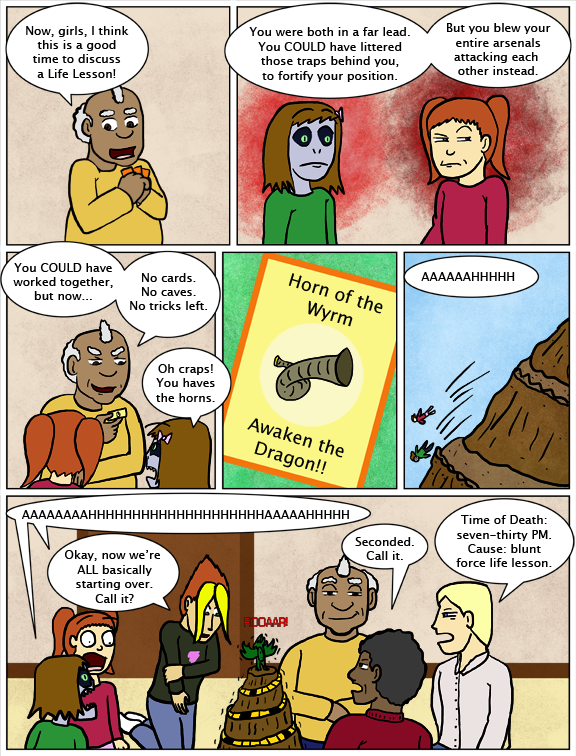 Plus, the probability of someone having the Horn of the Wyrm card was probably very low and Amanda most likely didn’t even know it existed. Also, if they were going to do an ‘at least one of us will win scenario’ both girls would do that with anyone one else their other than each other. They would rather go for the ‘I might not win but I’ll make sure you wont either’ scenario. that probably depends on the game-mechanics of the various traps and such… say that if the glue trap was not placed directly in front of/in the same square as Amanda, forcing her to overcome it, or get stuck, then it WOULD have stayed there until the others got there and THEY had to deal with it… but since Selkie was annoyed at Amanda, she played it on her instead, and Amanda for her part in this, it looks like she just kept on going and egging Selkie on… if they had worked together, they would have both gotten VERY close to winning by blocking the other players from getting close enough before they got to the spot with the winning conditions, with the last few moved determined by dice rolls… and NOT by Deus Ex Theo… as for them being so close… well, again it depends on the board, and the various squares in between that Selkie has to REDO due to the Scorpion Maneuver, and that Amanda has to do the first time thru… who knows what kind of stuff is in those squares, those cards could have been very useful. as for what Theo said, it makes sense: if Selkie hadn’t placed the traps, the both she AND Amanda would have been MUCH farther along the path, but instead they wasted so much time and effort trying to kill off the other player that they ignored the object of the GAME… to get to the top and .. um… er… do whatever the victory conditions entail… steal the gold? get a dragon egg? whatever… if they had “cooperated” by NOT attacking each other, then one of them WOULD have won before the Dragon woke up on it’s own a second time… and Theo would NOT have used the Horn, because they would have been cooperating, not fighting… IE: Mari’s whole point of PLAYING that game in the first place, remember? 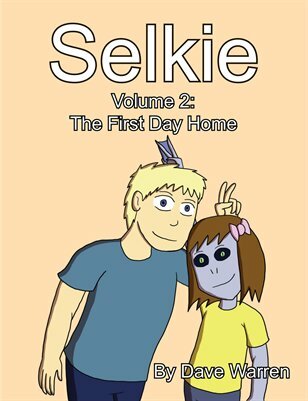 How were Selkie and Amanda supposed to know they should have worked together? No one told them that working together had better benefits. I doubt the game can have multiple winners anyhow, one of them would have had to have won and both of them want to win over the other. They couldn’t have known Theo would have the card and likewise couldn’t have known he wouldn’t have used the card if they worked together. It’s a good life lesson after the fact by telling them these things, but implying they should have somehow forseen these events is silly and would have been a terrible lesson. I assume the point was that they could have already both been at the top by the time Theo, uh, got that card? Dunno how the cards are given out… Amanda definitely could have used that lasso to hold on against the dragon, and we don’t know alternative uses for Selkie’s cards, either. “Multiple winner mechanic” is a matter of perspective. After the first place comes the second place. I’d definitely work together with someone to share first/second randomly and leave the rest of the competition behind. If you produce a rules list, i will code it. Or if you would like, I can make the rules based on what we have seen so far and fill in the gaps in the rules. Yes, potentially another nice game. But dude, someday you have got to look at a man’s normal button-front dress shirt and COUNT THE BUTTONS.